We just upgraded to 2.8-beta b952. Where is the option to Edit tasks for the Scheduler? I only now see "Edit Settings" but cannot access the list of tasks. We are using the same config.xml file as before and this has content. 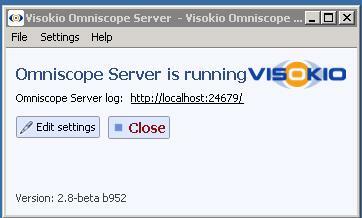 Visokio Enterprise is running a service in the background. Please disregard I was able to find the Edit Configuration option, however, is there a way to create a shortcut to this. Previously, we were able to open the Scheduler and edit tasks separately from the actual Omniscope application. BTW, thank you for making these changes to the Scheduler interface. This helps a lot. Catherine - The Scheduler is a separate application, and you can place a desktop icon to launch the Scheduler directly...from version 2.8 it is now called Server, because starting with version 2.9, it will handle more server-side tasks than just Task List scheduling. Note that if you are running Server as a Windows service, with no desktop visible, you will need to use a separate spare key installation to manage the Task List from a shared location. In this case, it is the spare key installation that needs the desktop launch icon, not the production server. I am seeing the Omniscope Server, however, when the window for that application opens, I don't see the option to Edit/Configure tasks as we used to see in the 2.8 version. See screenshot. We are implementing a fix for that issue, and it will be available shortly.